Thank goodness it’s Friday! Unfortunately, Group 2 will have a lot of research to do over the weekend. To summarize our previous posts, our group has a lot of important, individual interests while simultaneously lacking the will to narrow it down to a concise thesis at this point in time and based on our limited knowledge of the captivating themes. Furthermore, it will be difficult to compare and contrast Japan and China when those themes don’t necessarily transfer across all that smoothly. The role of Confucianism in the content, delivery and acceptance of particular tales. Discussing and analyzing the intertwining of ideas in a tale with animistic/ Confucian/ Buddhist components. Pick two, well-known tales, one from Japan and one from China during the same time period, and then analyzing culture similarities and differences. This idea differs from the first due to its broad nature–coming from the same time period allows us to see what religious/political/social beliefs were prevalent. In addition, we could potentially find one tale with a Japanese adaptation from its original Chinese version, witnessing how Japanese sought to separate itself as unique and superior to China. Following off of the previous idea, another compare/contrast idea could focus on how Japanese people were portrayed in Chinese tales, and vice versa. Nevertheless, the first presentation went well, and after this weekend we will have a much more specific plan to execute. As it has been said, we are still brainstorming. Therefore, allow me to go into detail about a specific idea previously mentioned. Personally, I am very interested in the Tang dynasty. Prior to this cycle, China was under warring times in which power was decentralized and many families across the nation grappled for power. Finally it was unified, and under the first emperor of the Tang dynasty, Kao zu, many reforms were made. His son, Tai zung, after killing his brothers and forcing his father to step-down, started the golden age of China. It was towards the end of this dynasty that Buddhist influence in the state faltered, and a more pragmatic approach to state-building was later adopted by the Song dynasty. If primary sources are available, this time period would be really interesting. First off, there is still a pervasive belief in the mystical. However, the role of Buddhism in China is changing, which could be evident in folktales. In addition, strong, centralized power could have an influence on literature, and obviously the only primary sources we can make use of are the ones written down. Therefore, literature (specifically folktales) can be recorded and commissioned for the purpose of creating order. Basically, warring clans and invading neighbors were a frequent occurrence in China’s long history, so whenever there is a long, prosperous dynasty it is worth examination. 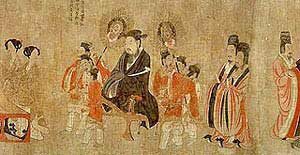 And specifically, the Tang dynasty is the perfect period since it is rich in Buddhism, Animism, and Chinese literature. That’s all for now. Happy weekend!